I will be doing a series called “Eat This!” It’s recommendations for fabulous dishes, restaurants and products. I’d like to encourage readers to post with their favorites too, because when something is good, it must be shared. No man is an island. Today’s Eat This! takes us to Italy and should really be called Drink This! illy coffee is an Italian way of life. A distinct coffee made from Arabica beans found on four continents and purchased directly from the farmers. Balanced, sweet perfection. At illy, economic, social and environmental sustainability are top priorities. Farmers earn above market price and maintain low-impact growing practices in exchange for business training. In 2000, illy founded the Clube illy do Cafè in Brazil which now includes more than 600 growers. Through the program, illy establishes direct relationships with the growers, based on the exchange of knowledge and mutual growth. illy is picked, roasted and packaged, then sent around the globe in recyclable packaging. illy issimo is a line of to-go bevys, perfect for summer and great if you’re in a rush. Although a hot, freshly brewed espresso is morning ritual in my world, so is running late. 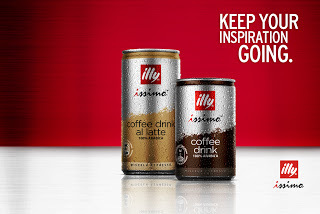 illy issimos are my Foodie pick for coffee on the go. Both sweet, the “caffe” is for purists: the first ready-to-drink coffee without milk and “cappuccino” is blended with low-fat milk and a touch of dark cocoa. It’s quite a treat and just enough in a slim little can. Coffee’s invigorating qualities date to at least 1500, when Sufi Yemenis started drinking coffee to stay awake during prayers. Rapidly spreading across Europe in the early 1600s, coffee became valued as a medicine. Caffeine was first identified in the early 1800s by Ferdinand Runge, a young German doctor who recognized the substance’s stimulating effects on the central nervous system, and its proclivity to maintain attention and a good mood. The naturally-occurring caffeine in coffee reduces sensations of hunger. Some studies suggest that just one cup of coffee can help relieve the symptoms of a migraine. Promising new research finds that caffeine in coffee may even stave off the onset of Alzheimer’s and Parkinson’s disease. Coffee is a powerful source of antioxidants, critical to eliminating free radicals. Espresso combines coffee’s most pleasingly complex taste experience and has comparatively low caffeine content. One espresso shot equally 40 to 75 mg of caffeine, an eight oz. cup of coffee is between 100 to 125 mg. If you’re looking for a morning pick-me-up, make sure to make it a double. Arabica-based espresso, like the illy blend, contain about half the caffeine of Robusta-based blends. Find illy coffee at Sur la Table, World Market, Zupans and other gourmet shops.